Ingrown toenails occur most commonly as a result of trimming toenails improperly. Rounding the edges of toenails instead of cutting them straight across creates areas that may later grow into skin. Shoes that are too tight, especially in the toe box, can also encourage curved nail growth into the skin. A person’s posture, gait, and any structural abnormalities of the feet (hammertoes, bunions, and foot pronation) may also affect one’s tendency to develop ingrown toenails. Having broken, brittle toenails may leave you with sharp nail edges that can grow into skin. Do try to coax a stuck toenail out from beneath overgrown skin by soaking the affected foot three to four times a day. Dry the foot well and wear comfortable shoes that do not crowd the toes until the area is healed. Insert a very small wad of cotton or waxed dental floss between the nail and the skin to encourage separation. Change the packing material every day. Take over-the-counter pain relievers like acetaminophen or ibuprofen to minimize discomfort. It’s important to seek medical treatment if the condition becomes worse or doesn’t improve with home treatment within 2 to 3 days. Don’t fall for the home treatment that alleges an ingrown toenail can be cured by cutting a V-shaped wedge into the top of the nail. Proponents claim this encourages nail growth toward the center of the nail, instead of at the sides where the problem is located. This simply isn’t true. All nail growth occurs from the base of the nail toward the top of the toe. When home remedies aren’t enough to treat an ingrown toenail or the condition is associated with severe pain or infection, surgery may be necessary. Depending on the extent of the problem, a doctor may remove part of the nail, part of the affected nail bed, and some of the surrounding affected tissue. In extreme cases, the doctor may remove part of the growth center from which the nail grows. After ingrown toenail surgery, treat the affected toe and foot with care. Apply antibiotic ointment and take over-the-counter pain medication as directed by your doctor. Keep the surgical area dry and dress the wound as directed. Ask the doctor when it is okay to bathe and follow the doctor’s directions. For at least the first 2 weeks after surgery, wear tennis shoes or other comfortable footwear. Avoid strenuous physical activities like running while healing. Notify the doctor if increased drainage, redness, swelling, or pain develops. Wearing appropriate footwear is one of the best ways to decrease the risk of ingrown toenails. 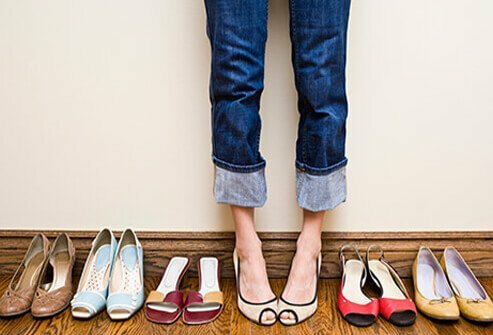 Feet swell during the day, so it’s best to shop for shoes later in the day when feet are at their largest. 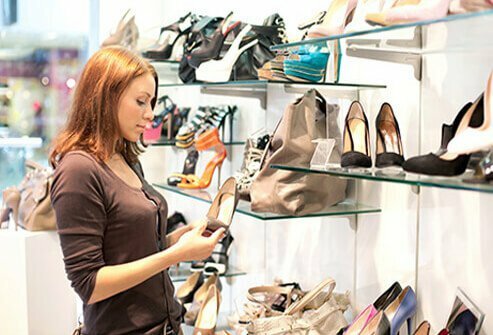 Choose shoes that have shock-absorbing soles that help reduce pressure on the feet, especially the toes. Breathable materials, such as leather and canvas, are preferred. Wear shoes with socks to minimize friction and cushion feet. Trim toenails in a way that minimizes the risk of developing ingrown toenails. Cut toenails straight across with a clipper. Do not attempt to shape toenails into an oval shape. This leaves rounded nail edges that may later grow into the skin. Don’t trim toenails too short. Toenails serve a function to help protect the toes. If toenails are hard to trim, soak feet in warm water first to soften them. There are also over-the-counter creams containing lactic acid or urea that make nails softer and easier to trim. Tending to toenails properly today is the best way to prevent ingrown toenails tomorrow.